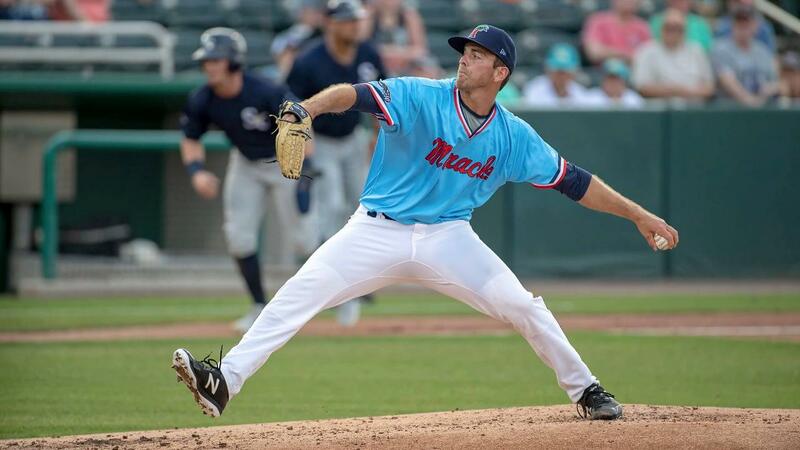 FORT MYERS, Fla. - Bryan Sammons pitched 5.2 scoreless innings to help the Fort Myers Miracle defeat the Dunedin Blue Jays, 4-0, on Wednesday afternoon at Hammond Stadium. Sammons allowed just two hits. The left-hander walked three and tied a career high with eight strikeouts. With zero earned runs, Sammons makes it five times in the first seven game a Miracle starting pitcher has not allowed an earned run. Fort Myers broke through in the second inning. With two outs and runners at first and second, Aaron Whitefield doubled in a run. Mark Contreras followed with a two-run double to push the lead to 3-0. The game remained 3-0 until the eighth when Lewin Diaz knocked in an insurance run with a sacrifice fly. Diaz, with a 2-3 afternoon, is hitting .500 (9-18) on the season with a home run and five RBI. Calvin Faucher followed Sammons and continued his strong start to the season with three scoreless innings. The former UC Irvine Anteater has tossed five scoreless innings to begin the year after posting a 7.30 ERA with the Miracle (six games) in 2018. Alex Phillips earned a one out save by striking out Samad Taylor with the bases loaded to end the game. The Miracle have posted back-to-back shutouts and have not surrendered a run to Dunedin over the last 21 innings. The Miracle go for the series win on Thursday night. Jhoan Duran (0-0, 0.00), who tossed four no-hit innings in his first start of the season, takes the mound for the Miracle. First pitch is at 6:30 p.m.